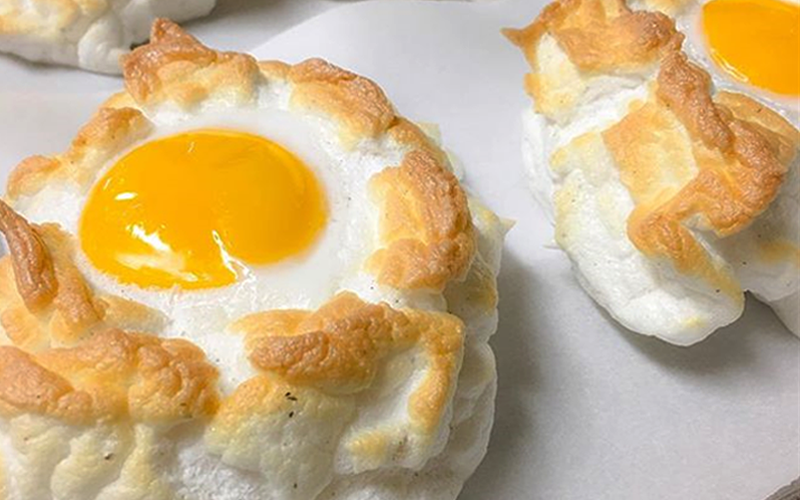 Cloud eggs are the latest food trend to take over social media this summer, and best of all they are easy to make too. They’re great by themselves, or with other garnishes. Or even on top of a bagel. They’re delicious and easy to make, despite their impressive appearance. Definitely worth adding to your weekend breakfast dish. · The first step is to separate the egg yolk from the egg white. · Whip egg white until fluffy and easily form peaks. · At this point you can add herbs, cooked bacon, smoked salmon, cheese etc to the egg whites (depending on your tastes). · Place the whipped egg white on a baking tray, create a dent on top (where you will later lay the yolk) and cook in the oven on 180C, until golden on top (usually around 6-8 minutes). · Take the tray out using an oven mitt, and place the yolk on top. Cook for a further 2-3 minutes or longer (depending on how runny you want your yolk). · Serve your cloud egg with your desired garnish (for example toast and avocado).